Wildlife charities say news of a review of EU rules protecting habitats is "very alarming" and could water down vital protections for wildlife. George Osborne told MPs he wanted to make sure that "gold plating of EU rules on things like habitats" were not putting "ridiculous costs" on firms. 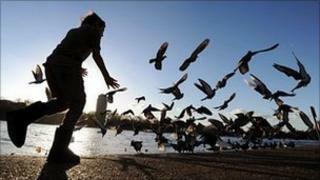 Later, the government announced it would review the implementation of the EU Habitats and Wild Birds Directives. Charities said important protections should not be "brushed aside". In his Autumn Statement on Tuesday, Mr Osborne said he was worried about the impact of some EU rules on UK firms and warned against pricing "British business out of the world economy". "If we burden them with endless social and environmental goals - however worthy in their own right - then not only will we not achieve those goals, but the businesses will fail, jobs will be lost, and our country will be poorer," he said. "We will make sure that gold plating of EU rules on things like habitats aren't placing ridiculous costs on British businesses." The Department for the Environment, Food and Rural Affairs has announced it would be reviewing the impact of the EU Habitats and Wild Birds Directives in England "focusing in particular on those obligations that affect the authorisation process for proposed development, with a view to reducing the burdens on business while maintaining the integrity of the purpose of the directives". The RSPB suspects that the review is aimed at watering down environmental protections, to the benefit of business and says there must be no weakening of protection for important species. RSPB conservation director Martin Harper told BBC Radio 4 the charity was "still reeling" from Tuesday's announcement and said the chancellor's rhetoric was "incredibly unhelpful". Spokesman Tim Webb told the BBC the announcement came "out of the blue". "It was very unexpected and it was very alarming," he added. "[The directives] have been protecting welfare and natural heritage for the last 20 years... it doesn't stop development or business growth. It improves and enhances that development. "It actually makes a great deal of economic sense because it improves development and makes them nicer places to work, live and play in. It is hugely important for protecting all sorts of different wildlife." We have lost patience with the Treasury. "It took a lot of hard work and effort, an awful lot of time to get that legislation in the first place - but just to brush it aside now, after 20 years of success, is incredibly alarming." The charity believes there is tension at the heart of government between Defra and the Treasury. The Wildlife Trusts are concerned that the review is "an attempt to ease the way for major developments on land and on our coasts". The charity's chief executive Stephanie Hilborne said it meant sites and species of European importance faced an uncertain future. "The Wildlife Trusts are well known for taking a pragmatic and constructive stance in its dealings with developers and local authorities on the ground and with national government. Now we have lost patience with the Treasury. The wrong outcome from this review risks driving a wedge between developers and conservationists at a time when we ought to be co-operating more than ever." Environment Secretary Caroline Spelman said she strongly supported the aims of the Habitats and Birds Directives which "protect our rarest, most threatened habitats and species" and wanted to "maintain the integrity" of the EU laws. But she said there were a small number of developments which raised complex issues "which give rise to unnecessary costs and delays" and in some cases the rules might be being used in ways for which they were not intended - which could undermine them. "I don't want to see that happen. That is why I am looking forward to seeing recommendations on dealing with any overly-bureaucratic or long, drawn out examples of implementation, without compromising the current levels of environmental protection." Mr Osborne was backed by Country Land and Business Association vice president Harry Cotterell, who told BBC Radio 4's Farming Today: "We have always had big, big problems with the Habitats Directive and the way it is being implemented in this country. "We think it is being over implemented, and we think that this is a very very welcome attempt to possibly melt some of the gold plate on the directive. "Finally we might see a time when human beings are treated with about the same importance as bats, newts and dormice."